At Rynok Sq. 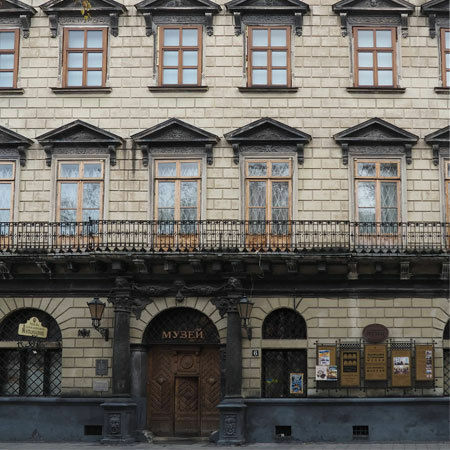 in Lviv one’s attention is attracted by the monumentality and palace character of the building number 6. This is the Korniakt House, one of the most prominent monuments of civil Renaissance architecture of the sixteenth century in Ukraine. History has left us two names associated with the construction of this building – vintner Kostyantyn Korniakt, the Greek in origin and architect Pietro Barbon. Kostyantyn Korniakt settled in Lviv in 1569. He moved here from Moldova, where he grew rich on customs work and wine trade. He was very educated man, knew several languages and had relationship in many Eastern countries. King of Poland Sigismund II Augustus invited him to the post of personal secretary and in 1571 gave him the title of nobility for certain services. In 1576 another King Stefan Batory confirmed the nobility and granted Korniakt a special privilege allowing building a house with six windows on the facade at Rynok Sq.